Nothing says "I love you" or "You are the best" or "Let's be friends forever" than an over-the-top, chocolicious multi-layer cake. ....add about three scoops of Moosetracks ice cream and this would be my last meal. When slightly warm, it can be used as a glaze. 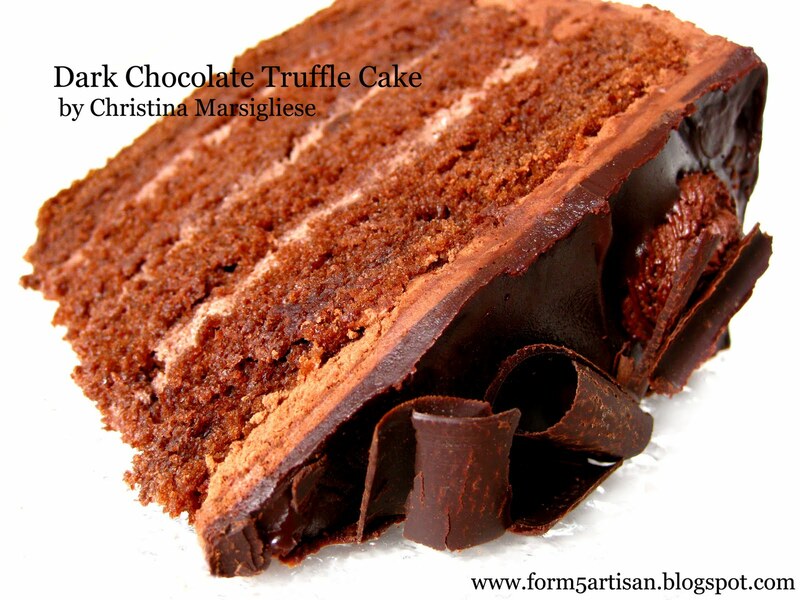 Let it cool to room temperature with frequent stirring and it can be used as a creamy dense frosting. Bring on the beaters at room temperature and it transforms into a light, whipped frosting or filling. Or, let it firm up without agitation and form blissful balls of silky smooth chocolate to make decadent chocolate truffles. 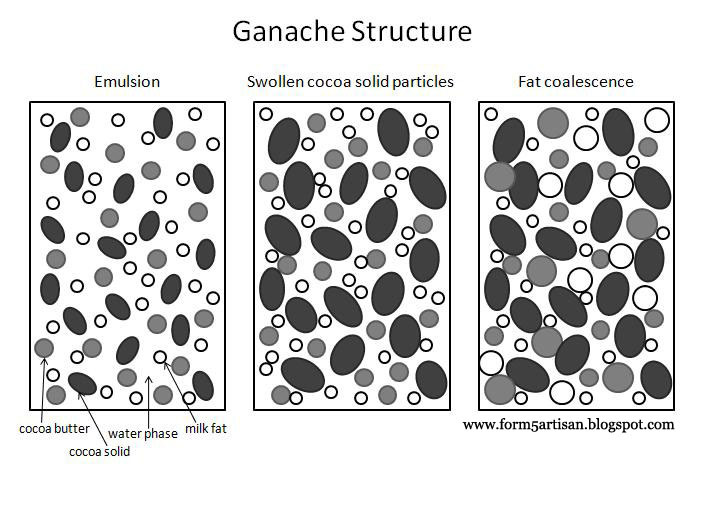 Ganache is an oil-in-water emulsion of cream and chocolate. The continuous phase is composed mostly of water from the cream and the oil phase is composed of both milk fat globules from the cream and cocoa butter fat droplets from the chocolate. Cocoa particles are also suspended in the water phase and some of their components can bind water. Ganache can be made from anywhere between a 1:1 ratio of cream to chocolate to a 1:2 ratio. The latter ratio will produce a firmer texture, and the extent of firmness depends on the cocoa content of the chocolate. Couverture chocolate is a high quality chocolate that is ideal for making ganache due to is increased cocoa butter content, which gives it good melting properties. 1. Very finely chop the chocolate and place it in a heatproof bowl. 2. Heat cream in a small saucepan over medium heat just until it comes to a boil so that small bubbles begin to form around the edges. 3. Pour the hot cream over chopped chocolate. 4. Let mixture stand without stirring for about 10 minutes. 5. Gently stir mixture in a circular motion using a rubber spatula, starting from the center and working your way out to the sides, until it is smooth and glossy. 6. Pour mixture into a shallow glass baking dish and let stand at room temperature until firm. Although this process seems fairly simple and straightforward, there are some technical points to remember. Finely chopping the chocolate allows for rapid and even melting. Letting the mixture stand for 10 minutes allows the hot cream to slowly and gently melt the chocolate. It also allows the mixture to cool down, preferably to about 110 degrees F, before stirring. This helps to form a homogeneous, smooth ganache as it lets the chocolate and cream come to the same temperature, making it easier for the two phases to form an emulsion. A proper emulsion will prevent separation of the oil phase once the mixture is set. Chocolate is very high-maintenance and requires gradual heating and cooling. Over-mixing can cause a rapid decrease in temperature, which may result in a coarse texture. 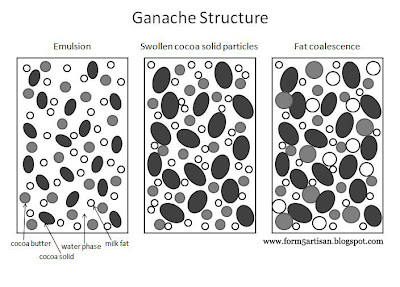 Gentle stirring is all it takes to reduce the fat to tiny droplets suspended within the water phase, helping the mixture come together and form an emulsion without separation or graininess. Too much agitation can introduce air bubbles into the mixture and break the emulsion. Remember how I mentioned that cocoa particle components can bind water? Well, this attribute is one of the reasons why a smooth, glossy ganache can set up into a grainy, separated mess. A ganache made with a high ratio of chocolate to cream, especially when using bittersweet chocolate, is more susceptible to developing an unappealing texture. As the mixture rests, cocoa particles bind moisture from the water phase of the emulsion and swell up. This makes less room in the water phase for the milk fat globules and cocoa butter droplets to remain individually suspended, causing them to coalesce or merge together to form a single droplet. These larger fat droplets cannot sustain their suspension and separate from the mixture. 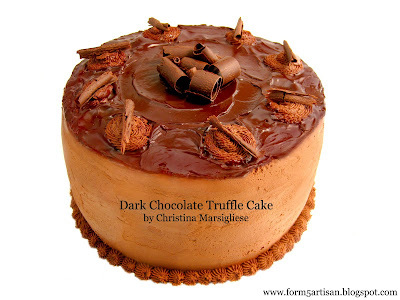 Eventually, the water-logged cocoa particles can stick to each other and cause the ganache to coarsen or become grainy. Pouring the stirred ganache into a shallow dish exposes the mixture to a larger surface area and helps it to mature evenly at room temperature. Maturing ganache refers to the gradual and complete crystallization of cocoa butter, which creates a sinfully smooth, melt-in-your mouth texture. I do not recommend immediate refrigeration of ganache because it can develop an oily or greasy consistency as it warms back to room temperature. Geez. What once seemed like the easiest recipe in the world with only two ingredients - a simple mixture of cream and chocolate - now seems like a trick! But, like all things, practice makes perfect and patience is definitely a virtue! I'm going to go make some ganache now....If you see me in a few hours don't be shocked if I'm in a chocolate coma. Amazing! Thanks for the information. I really enjoy your posts! Great enterprise Cristina! Kudos for it! Cesar - Your input is always welcome. In this post I am discussing chocolate and not cocoa powder. Bittersweet chocolate with a high content of cocoa solids has a relatively high starch content which tends to dry out batters for cakes, cookies, etc. A cocoa solid particle is a complex material consisting of both soluble and insoluble fractions, and although not entirely soluble in water (that's why you can see cocoa solids settle to the bottom of homemade hot cocoa), some components indeed bind moisture and solubilize, especially under high temperatures used when making ganache. i just wanted to say that i love your blog! your baking tips are very helpful and your pictures are beautiful! Thanks so much Blake! I'm glad you enjoy my blog. Feel free to post any baking-related questions that you may have! I wish someone would tell me they love me with a dark chocolate truffle cake! This is the best blog out there. I need to go on a diet just looking at these pictures. I’m very lucky to have such a talented best friend who made us this cake. This chocolate cake is the best cake I have ever tasted! And trust me I have tasted a lot of chocolate cake!!! Jody, I think you're allowed as many truffle cakes as you'd like with all the marathon running you do! Next time you're up here, I'll have to whip one up for ya! And I definitely agree - chocolate cakes seem to say a lot! Why is this posted in the recipe index when there is no actual recipe? It is kind of awful to not have the recipe, especially when it makes it seem as if there would be a recipe. Hi I just stumbled upon your website and boy, what a novice baker's blessing that has been! I've been looking for a solution to a baking issue, but all my research so far has been coming up empty. So I'm hoping you can help. I would like to know how to keep melted chocolate from sinking to the bottom of a cake when baked. Sometimes when I pull my cake out of the oven, I notice that the melted chocolate has settled in a sort of dense layer at the bottom. How do I prevent this from happening? Please help. Anyone one out there who knows how to fix this, please feel free to pitch in. Thanks a million. I'm just loving reading through your blog :) I'm currently trying to write my own truffle recipe, and I've heard of a few things you've mentioned in this post here, but I didn't know things like the gritty and course texture etc. Thanks heaps for putting a lot of good food science facts into your posts, I really do enjoy learning the why we follow the cooking instructions that we do, and what happens to the food after each step. Thanks for sharing, this was a great read! This is such a lovely comment Tina! Thanks for reading.